Well time has got away from me a little in the last week or so but I had a great time teaching at Stef’s Papercrafts Weekend Workshop. Loads of washing and tidying to do this week. Now onto more fun topics – being creative! If you have been reading my blog for a while you will know that I love my copic markers. My layout shows some examples of using Copic Markers on Scrapbook pages and was created for the Get It Scrapped article on the blog today. There are some great ideas for scrapbooking layouts using copic markers in different ways on your pages. 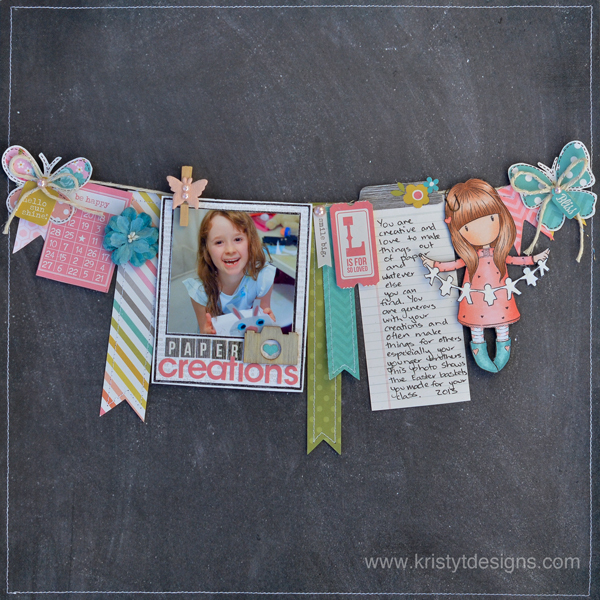 I love the Gorjuss stamp of the girl with the paper dolls and it just reminds me of my daughter and her love of creating things out of paper so I created this layout and coloured the stamp to match my other supplies plus made it look a little like her. It was the perfect embellishment for my page. I also used my copic markers to colour some Heidi Swapp Banners in colours that coordinated with the Simple Stories Papers and added a little colour to my wood veneer camera. The elements are arranged like they are hanging because it reminds me of displaying kids artwork. I chose the chalkboard background as it fitted really well with my subject and also allowed the colours, photo and embellishments to stand out. The stitching just framed it all and adds just a little more texture to the page. If you have any questions just leave me a comment. If you want more information about how I colour with copic markers you could check out the Copic Marker Cards Category on the sidebar. I have a posts on Getting Started with Copic Markers and the First 10 markers I would buy, as well as some favourite colour combinations and lots of cards using Copic markers. Michelle Houghton who is a certified copic instructor has lots of great tips on using copic markers on her blog. I had a hectic Friday with 10 little girls at our house for a movie night for my daughters birthday so not too much creative time at the end of last week! I have a card to share today that features the very cute Colouring Marci and some pretty papers from MME. I coloured Marci with my copic markers and paper pieced some of her clothes. I made sure to add some shading to the patterned papers to keep the dimension in my coloured image. Although you can use copic markers to make different patterns for clothing sometimes it is nice to just use a patterned paper. I punched some butterflies, stitched them to the patterned paper and then added some shimmer using a clear Atyou Spica Pen (which is instantly dry). I cut apart one of my hero arts clear stamps so I could make the sentiment fit onto the clipboard space and stamped in Jet Black Archival Ink onto a separate piece of white card. 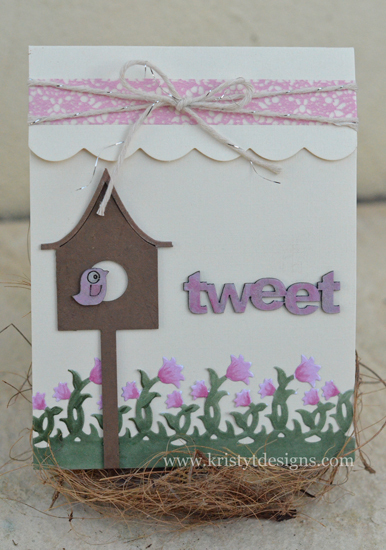 A kraft card base, some lace, some pink twine and little bit of inking finished the main elements of the card. I added Marci and the sentiment piece with some foam adhesive and the card was done. If you have any questions please leave me a comment. Have a great week. When I saw these papers I knew that they would be perfect for scrapbooking about my growing interest in photography. I designed my layout before I had my photo but I knew what size I wanted it so was able to give my husband some guidance when I handed over the camera. I used one of the lightroom presets to change the colour in my photo but I am thinking that I may re-print the photo as the tone is a bit too green for me. I made this layout (minus the stitching and the photograph) in about an hour. I am loving using combination sticker sheets (ie they have embellishments, borders and phrases on the same sheet as some alphas) when I want to make a quick page. I used some walnut stain distress ink on a manilla tag and have put the journaling on it tucked behind the photo. I wanted a little more interest/texture on my layout so I cut a piece of the paper from another sheet of the base paper for my layout and distressed the edges and adhered it to the base piece. This kept things in the same colour palette but still with a bit more texture. I trimmed some of the other side of the patterned paper fot my photo mat. I used a bunch of the phrases, border and shaped stickers to embellish the layout and popping some of them up on foam adhesive to give the layout a little more dimension. I used some Prima canvas alphabet stickers and some older alpha stickers that I coloured with a copic marker so that they matched my layout. Some twine on the tag and a stitched border finished the layout. I have had the cute Beret Marci for a little while now so I stamped her using Memento Tuxedo Black ink onto blending card and took my warm grey copic markers with me whilst I watched my kids play sport. My youngest boy sat next to me and did some colouring with crayons. One of the good things about colouring in ‘black and white’ is that you don’t need to take so many markers and it is quite relaxing too. I decided to die cut the park bench out of white card to give her something to sit on and grabbed some grey bazzill card, some lace and patterned paper from the Prima Divine paper pad, some metal rings and a banner I had stamped ages ago which was in my container of leftover bits and pieces to make the card. I distressed the edges with my distressing tool and stitched a border to give the card a bit more texture and popped Marci up using some foam adhesive. I haven’t done much copic marker colouring lately so I pulled out my copics and coloured in this cute Luka image from La La Land Crafts to make a slightly different Mother’s Day Card suitable for a child to give to their mum (or it could be used as a child’s birthday card or a bunch of other occasions). I also wanted to use some washi tape to make a background for my card so I used some of the new All About a Boy washi tapes plus a yellow Bella Boulevard tape across a white card base, then added my image panel over the top. Some twine and a sentiment sticker from Simple Stories finished off the card. 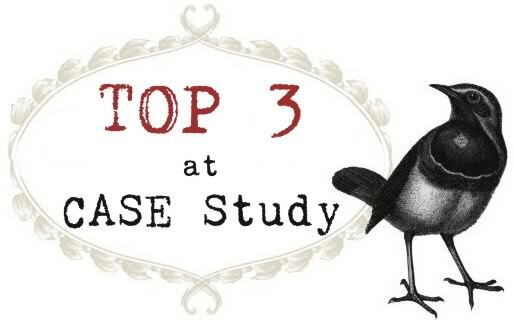 I am back again playing along with the CASE Study challenge. 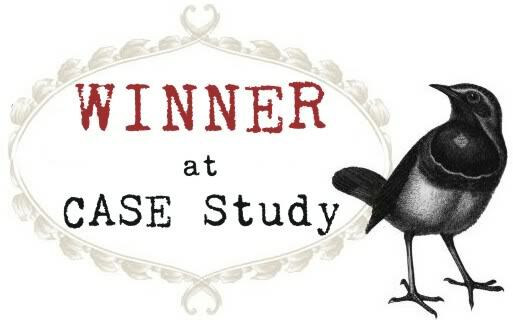 This is the last week with muse JJ Bolton and you can see her card at the CASE Study blog here. Although my card looks nothing like JJ’s card I took inspiration from the colours – blue and yellow, the butterfly and the sentiment when I made my card. I have had some embossing diffusers for ages and have never used them so decided to give one a go and I was quite happy with the result (it was easy to use and I felt a bit silly for not giving it a try sooner!) I used the circle part of the diffuser as a mask and misted the embossed panel with blue glimmermist. I ended up adding more blue using some faded jeans distress ink (TIP: I used a piece of cut and dry foam,press the inkpad onto my craft sheet and then pick up the ink off my craft sheet rather than taking the ink directly from the ink pad since this stops my ink pad from getting shimmery bits on it from the glimmermist). I stamped the butterfly with Tuxedo Black Memento ink and then coloured with copic markers. I decided to add some shimmer by painting some twinkling H2Os over the butterfly. I used some yellow over the whole butterfly which helped give the butterfly a more blended look over the part where the blue and yellow meet. They don’t interact at all since the copic marker is dry though I think it is just because the yellow paint is translucent over the light blue so it makes that area look a bit more green.I also added just a touch of blue around the edge of the butterfly. 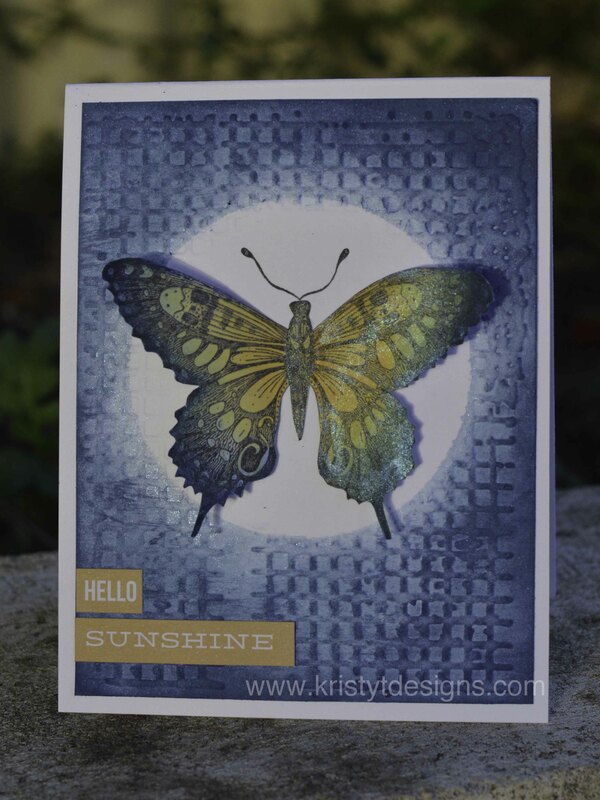 I stamped just the antenna of the butterfly onto the embossed panel and adhered the butterfly to the card. Some stickers to make the sentiment finished the card, along with the white card base. I really like the look of the twinkling H20s over the copic markers so I will definitely be trying this out again. I first saw the technique over a year ago and have no idea where that was now so I am sorry I can’t provide you with a link. Thanks for stopping by and remember if you have any questions just leave me a comment. Supplies: X-press It Blending card, Copic Markers – B91, B95, B99, Y32, Y35, white card, Memento Tuxedo Black ink, Twinkling H20s, Snap Life Alphabet Stickers, Penny Black Slapstick Cling Stamp – Soft Wings, Texture Fades Embossing Folder – Grid Matrix, Tim Holtz Alterations Embossing Diffuser Set #1. I have been kind of absent from my blog due to our hard drive crashing, being away with family, going to a great wedding and just general life I guess. I have also been busy finishing off projects for Stef’s weekend workshop this weekend. You can see sneak peaks of what we are creating over on her blog. But now on to todays card. I coloured in this tulip border die cut in November last year when I was demonstrating colouring with copic markers at the Albany show but I hadn’t made a card with it yet. So I grabbed some chipboard, some Twinkling H20s, a Jenni Bowlin paint dabber (brown sugar) and set to work making this card. I used a card base that had already been folded and had the scalloped edges so it was relatively quick to make this card. Some cute Maya road twine (I am loving the thin thread of silver through the natural coloured twine) and some wash tape added some colour and detail to the top of the card.